6.64 points at 11 votes (rank 459). In Trash Course you steer one or two trash cars at the same time and you have to collect as many trash bins as possible; because they give you lots of points and will finance the next car. In order that this is not so difficult, the cars are equipped with a rocket launcher and they can fire up to 3 rockets at once. 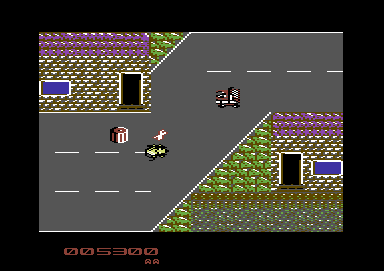 In the first level the rapid journey goes through the town Timbone. The town is contaminated with rats. The inhabitants' dogs go crazy and throw bones around. Gangs are running riot in their high powered cars, shooting for fun. At the end of the level on of the gang bosses has blocked the street with a giant tank. If you survive in the fight against the tank, you will reach the desert of Timbone in the second level. There you will meet very snappish scorpions. 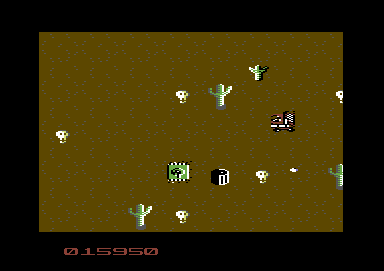 You can receive additional points by shooting small cacti. However, they need to be hit 5 times. The desert is also watched by the militia if the Walker Group, a especially wild gang. They have dug several tanks into the ground and at the end of the level you encounter the headquarter of this group. After this very hard end fight, we go on in the third level into the Forest of Kafkat. There you will meet more gang cars. Some even follow you. By forbidden chemicals in the sewage, the spiders living there have mutated. As end boss you have to face two of these huge tarantualas. In the fourth level you finally make your way to the chemical plant, which caused all this chaos. The way there is even harder than before. All the enemies and two new tank types try to avoid that you ever reach the plant. If you should even so manke it, you need to destroy the main building of the plant. This is protected by a mobile security system. After that you will see the final message... and the game ends. The games was devoloped with the help of Sideways-SEUCK. Here the game scrolls from right to left in contrary to the standard SEUCK. 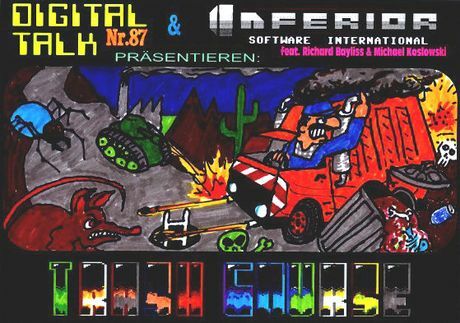 As background partly graphics from Gold Quest 4 were used. 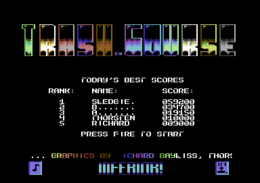 Richard Bayliss also built in a few additional things: animated water and quicksand, a highscore tabel for the 5 best scores, a title screen with scrolling text including a short description of the game and three suitable pieces of SID-music. Collect 18 trash bins in Timbone and destroy the big tank. Collect 12 trash bins in the desert of Timbone and destroy the fortress of the Walker Group. Collect all trash bins in the forest of Kafkat and defeat all mutated tarantulas. Collect all trash bins on the way to the chemical plant and destroy the security system. Shoot brown rat on the street (Image 1). Collect trash bins on the upper grass (Image 1). 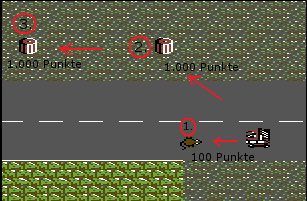 Shoot the rat on the street (Image 2). Gully timing: wait until the rat comes out. Beware: gully rats are invincible and appear randomly! (Image 2). 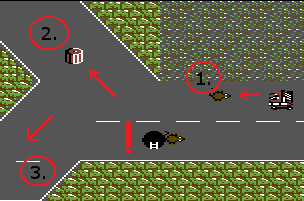 Then go diagonally to collect the trash bin and then go along the street a bit lower (Image 2). Shoot the black rat from the front and the brown from above. Collect the trash bin at the upper roadside. Over the stone bridge the way leads directly to Timbone, shoot the gang car with double-rocket (press fire button 2x). Shoot the dog with triple-rocket (press fire button 3x). Watch for the gully and drive diagonally upwards, there remove the gang car with double-rocket and pick up the trash bin. Take the next dog directly in front of the trash bin with a triple-rocket and straight after that collect the trash bin. Now you take the next bridge to the Inferior Highway. There shoot the gang car below with the double rocket. Image 2 - the gully, timing is important! When facing the end boss look out for a safe place and wait for 30 seconds in each of the first 3 levels and 40 seconds in the fourth level. Already in the third level it is very hard to find a safe place. Here it is advisable to have many trash cars in reserve to survive the time . Sledgie: "For me personally, the game is a degree too hard. 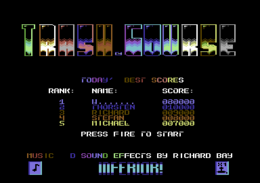 The first two levels can be made well to fairly after some tries. The following level is rather difficult. I haven't reached the fourth level without cheat yet. That is why the last images are missing in the solution section. In the beta version especially the first level was much harder. Here the reports of the beta testers and the simple hint from a user were very helpful. The critical comments to Gold Quest 4 by Robotron2084 prompted me to make the game a bit more unpredictable and more difficult. E.g. the rats appear randomly from the gully and cannot get shot. What I like in particular, is that a fair 2-player mode was realised now. The known bug in SEUCK, that all collected points are awarded to the second player, was resolved. The public development in the Forum-64 and the help of the Forum-64 users were lots of fun. Many thanks at this point." Champ: "I have played TrashCourse now, really a great game, the difficulty level is exactly right, great work that you have done, I am very enthused! :-))"
This page has been accessed 13,424 times.